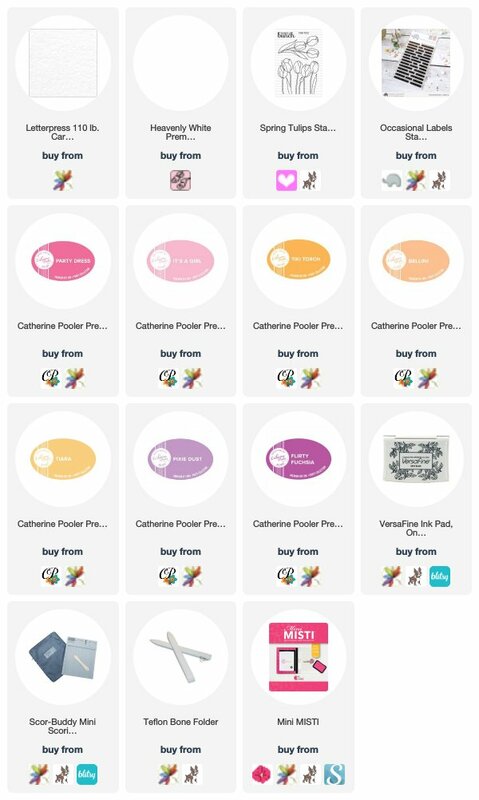 If you’ve been a follower of my blog for even a little while, you’ll know that I’ve had somewhat of an… aversion to flower stamps. It’s not that they’re not pretty or nice or anything, it’s just… after seeing them everywhere for years and years and their (to me) identical appearance no matter who designed them, I’d just… had my fill. I as good as put all of those stamps away, and apart from Design Team posts or the odd commission, I didn’t want to even use them anymore. Then, slowly, over time, something started to change. Much like a seed that had been planted and needed to grow, my love of flower stamps needed its time, hidden beneath the ground without seeing the sun, to germinate and blossom again. And after years of slow cultivation, I think I can finally say that I’m falling in love with floral stamps all over again. Not all floral stamps, mind you. I still feel that they are ten a penny (or a dime a dozen for my US folk! ), and that they are largely all the same. 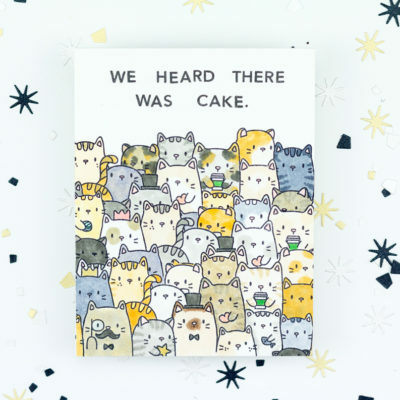 But over time there have been a handful of companies that have either been new to the scene, or breathed new life into their designs – and the stamping market is now filled with a bouquet of glorious, riotous designs that offer something *different*. From stunning layered designs, to abstract doodles, to botanically accurate masterpieces, the world of floral stamps really has a dazzling and almost dizzying array of designs to offer now. At last. And so this is where I find myself, blinking sleepily in the light of the Springtime sun, ready to immerse myself, carefully, into that world again. 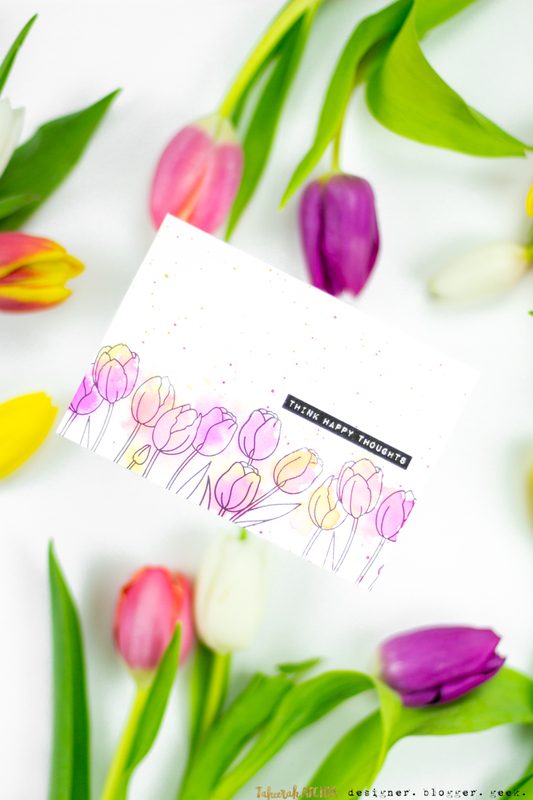 I couldn’t let such a momentous event escape without creating and sharing a floral card to celebrate. No DT assignments. No Guest Design work. Just me, and some new florals I love, and a bit of freedom to breathe, and create. 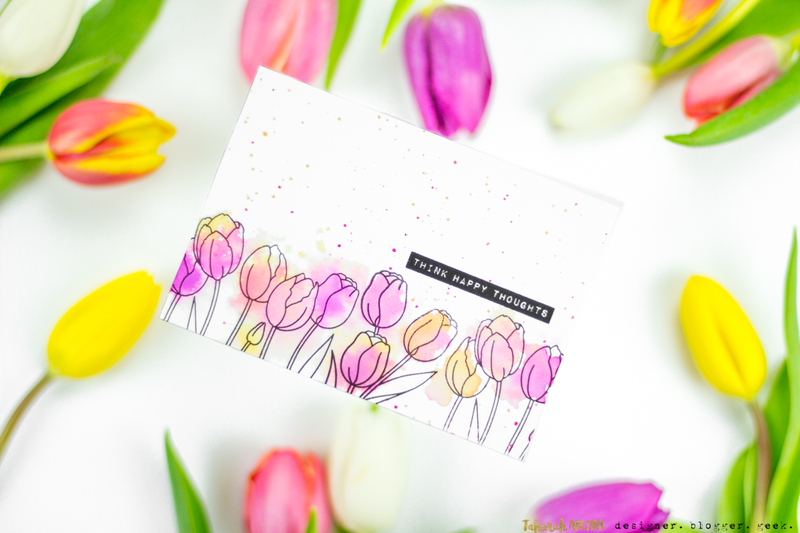 Tulips are amongst my absolute favourite flowers – so when I saw this new set from Clearly Besotted Stamps I simply had to have it. I stamped out the outlines with Versafine ink, then loosely watercoloured with my Catherine Pooler inks. I’ve tried to capture the vibrance and beauty in these photos – but you should see this in real life! A sentiment from Mama Elephant and some watercolour splatters finished this CAS beauty. The end result certainly makes me think happy thoughts. If anyone needs me, I’ll be staring at pretty blooms and dreaming up more designs. After all, it is Spring. Taheerah I love Clearly Besotted stamps – I have only just been recently introduced to the company but I think that all their designs are fresh and unique. 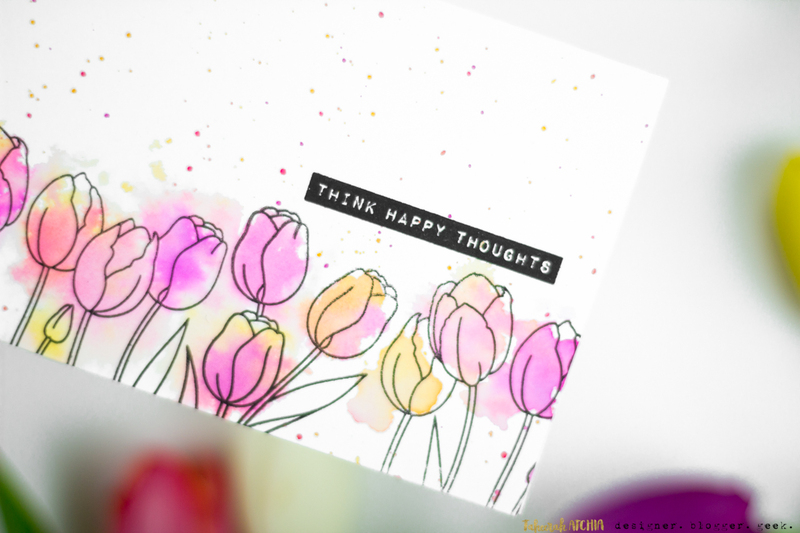 It is true about these tulips, the stamp is a floral image I have not see before and the cut off (showing just the tops of the tulips) too is a great idea. So pretty card with nice colors and flowers. Fabulous design, love the flower stamp you like and choose! Oh, how pretty! Love the soft coloring! Beautiful! Love the soft colours. And tulips always remind me of spring. I hear you with the flowers. I do have a few floral sets though as people like them. Isn’t it amazing how we are all so alike in some ways and different in others. I am always drawn to florals first, but not crazy about critters! And the thing about watercolor that got me brave enough to try it was this very loose look with doodle flowers. As someone who always thought there wasn’t an artistic cell in her body until into my sixties, I am now actually playing with putting down color first, then drawing my own doodle flowers!!! Maybe there’s hope for the “critters” in the future! Thanks for this lovely, dreamy, soft vision of spring. Beautiful card! Soft and very pleasant!! ? Gosh, this is so beautifully done and your photo is a piece of art!! Love the many colors of tulips!! 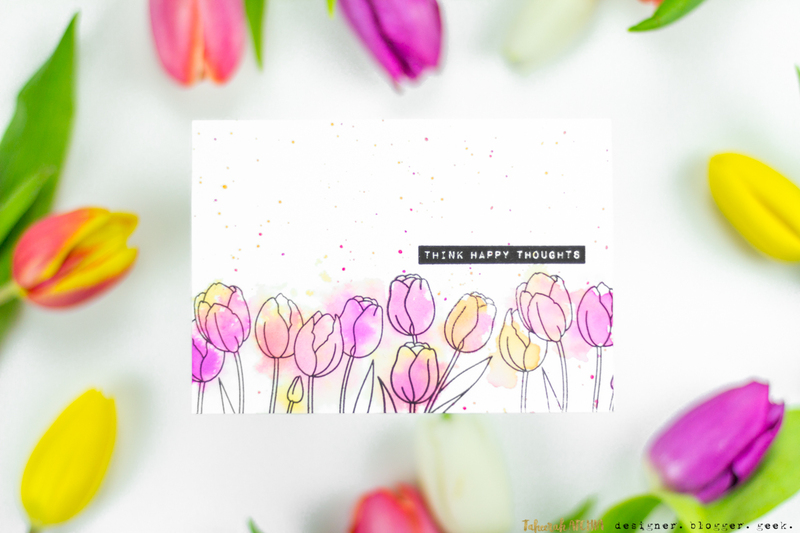 I love flower stamps and gravitate toward them all them to time, but…with that being said I know there are plenty times when I think “oh, that is so similar to one I have”! I’m glad you have “found” flowers again, and this card is absolutely stunning. I wish I could see it in person -perhaps you’d like to send it to me??? LOL. Beautiful! I know what you mean about the plethora of floral stamps, but I own a few from way back that I never tire of using with different media. Your loose watercolor is beautiful, and I owm a tulip stamp that just might work.